Luxurious Leto's Lodge, set in an exclusive cluster of villas. Beautifully combining traditional Greek rustic stone features with cool contemporary interiors and light white-washed walls, Leto's' Lodge is elegantly furnished. You have the choice of two bedrooms: the master with a king size bed, en-suite marble bathroom with Jacuzzi bathtub, separate WC and shower cabin, or the twin room with en-suite shower cabin and separate WC. Extra luxe features like make-up mirrors, luxury toiletries, slippers and towels add decadent finishing touches. 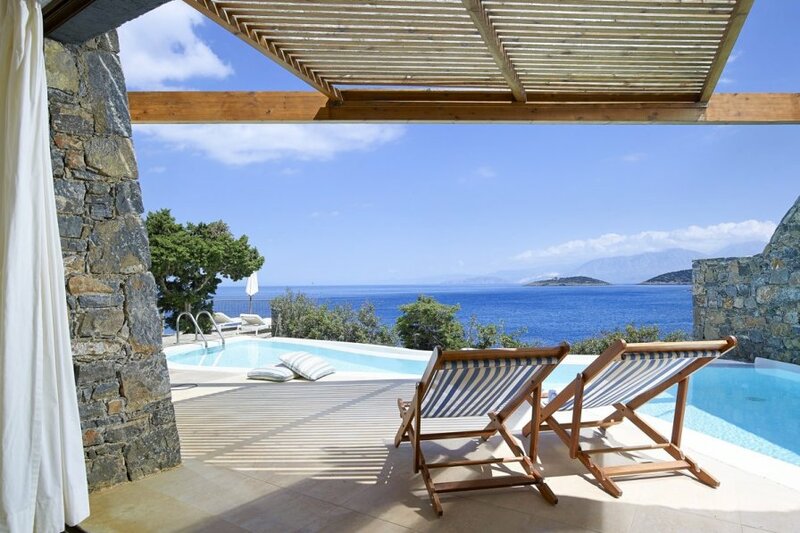 From Leto's Lodge, there are steps are leading down to the Aegean Sea below, where you can enjoy bathing in the crystal clear and calm waters. For an all-encompassing relaxing stay, breakfast can be brought to your room, and the hotel's restaurants, bars, beach and gym and spa facilities are all a comfortable 600-metre stroll from the villa through the private peninsula grounds. With individually controlled air-conditioning units in all rooms, a mini bar and Wi-Fi throughout, the facilities at Leto's Lodge are second to none. Plus, you're well placed to visit the charming local region of Agios Nikolaos – a welcoming inlet with a marina dotted with yachts and seafront cafes and tavernas – or beyond to the island's capital Heraklion or towns of Lerapetra and Sitia. Agios Nikolaos is a coastal town on the charming Greek island of Crete. It's located on picturesque hilly terrain and overlooks the idyllic shores of the curving Mirabello Bay. With largely modern architecture, a resort-style flair and tree-lined avenues, it's a perfect place to explore and soak in the friendly Mediterranean atmosphere. In Agios Nikolaos centre, you'll find a marina dotted with yachts and a deep lake, connected to the sea by a narrow inlet. Both are surrounded and overlooked by quaint cafes, restaurants and first-class local tavernas. You can take a wander around the shops with original items from woven fabrics to China and local delicacies on offer. There are also many ancient churches, scattered within the streets of Agios Nikolaos, including the small church which lends its name to the town. For day trips, you can drive to the island's capital Heraklion and immerse yourself in ancient culture. The vibrant port city is best known for the Palace of Knossos. The archaeological site dates back thousands of years to the Minoan civilisation. Guarding the city's Venetian port is the 16th-century Koules fortress. A drive around Heraklion will also bring you to traditional villages, Medieval castles, Byzantine monasteries and secluded coves.